Sturdy tables are a family camping essential not only for meal preparation and eating but for playing games and relaxing. Versatile designs in the Outwell Folding Table Collection include the low Heyfield that can be used as a breakfast tray. 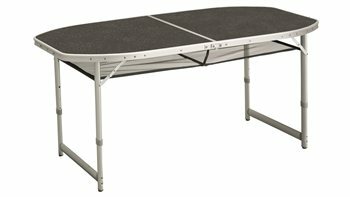 All tables fold away neatly for transport and storage and can be set up quickly and securely with easily adjustable legs to make a level surface on uneven ground. A rugged polypropylene moulded top used in Claros tables and the Corda and Pemberton Picnic Sets completes the portfolio. The Hamilton Table is compact and easy to carry yet very stable when opened. For picnic or camping the table fulfils your needs. Practical handle for easy portability. New models, new designs and new colours feature in the 2019 Outwell Furniture Collection of stylish, superbly engineered solutions for discerning campers seeking the very best in outdoor products. Inspired by Scandinavian design heritage and the wide-open spaces that surround us,sweeping innovation, versatility and attention to detail deliver smart designs with comfort, reliability and convenience as core values for home from home comfort. These ranges are not just for camping. Their smart lines and flexible use will ensure they’re not tucked away at home but used on the decking, patios and in the garden on an everyday basis. From new designs in the Inflatable Furniture and Padded Furniture ranges to Kitchen Tables and Storage with innovative features such as secure magnet closure rather than zippers, all feature irresistible colourways that complement our outstanding tents and awnings. The table is exactly what we wanted. When ordered the first table arrived damaged however the customer service care was excellent we sent off the pictures and details of the damage and Camping World replaced with no hassle what so ever.